The Greek conjunction “for” here connects this verse (verse 13) with the previous verse (verse 12). Earlier in verse 12 Paul wrote “work out your salvation with fear and trembling.” I know some readers might have alarms going off in their head with the question: do we contribute our works to our salvation? Paul is going to explain what that means and the way he is going to do that is explaining the cause of our “working out” of our salvation. The subject of the verse is “God.” This is evident from the Greek nominative case. What is significant here is that this verse is going to tell us what God does. Here the first clause Paul states “God is the one working.” In the Greek it is clear God is the one working since the participle “the one working” has an article and with a stative verb of “is” it is showing us God is the one who is working in believers, and there is no question about it; The one working within us is “equal” to God! When the verse says “to will” it focuses on what is internal to the believer; it means God’s work in believers entails that believers’ volition (will) is now to do what God wants. This verse is incredible if one realizes that before Christ our will is captive to sin in such a way we don’t want to even seek God according to Romans 3:10-11. When the verse says “to work for pleasure” it means God’s work in believers entails believers will actually carry out godly “work.” This “work” isn’t external pressure to do what is right in serving God; rather it is “for pleasure.” In other words, believers will have pleasure in doing godly work; and that pleasure is the work of God within the believers’ heart to now want to God’s work out of delight. This delight specifically is delight for God. In summary God works within the believers’ heart; believers now has a new will and actual behavior that desire to please God. Thus when a believer “endures” in His salvation with fear and trembling (Philippians 2:12) he should know that the power to do so is not His own but rather it is God working within Him. As mentioned in our first observation this passage focuses on God and what He has done for us. Sometimes in our Christian life we need to realize more of what God has done for us and not focus on our own effort to earn favor with God apart from the Gospel. In fact it is first understanding His gracious work does it move us to pursue serving Him out of a heart of gratitude, knowing He works in us! Marvel in this truth: Even when we work out our salvation it is God’s work! When we endure in preserving as saints, God is the one who is at work! Have you thank God recently for His Sovereign Grace? Have you thank Him for working within you? When your life is messy with sin and you are a believer, be thankful that God is not done with you; He will be working within you and your heart. While we are not perfect do you have a will to do what God wants? Do you actually have fruit of godly works? And is your motivation for godly works one of pleasure in God? If you struggle with the last point, confess any sins of your shortcoming; also pray for you to grow in your delight and pleasure of God to the point of having a will and actual behavior that is acting upon the motivation to please Him! Sometimes when it turns out none of the above in this post is not true in your life, it might be worth asking if you are a believer; pray to him for the Spirit to bear witness to you that you are saved! If it turns out you are not saved, count God’s fortune to show you this truth before it is too late; turn to Jesus Christ and trust in His person and works to save you from your sins! He’s lived a perfect life, died on the cross for the sins of those who will surrender and trust in Him as Savior! Thanks for this devotional word study! Roman Catholic apologists often use Philippians 2:12 as a proof text of salvation by merit. but as you point out here, context is the key. RE: While we are not perfect do you have a will to do what God wants? Do you actually have fruit of godly works? And is your motivation for godly works one of pleasure in God? When I was a young believer my spiritual walk was a revolving door of obey-fail, obey-fail, obey-fail because it was mostly about me and my efforts, and our first church reinforced that approach. I became exasperated to the point of walking away from the Lord. After returning to the Lord, He brought some pastors into my life who emphasized God’s grace. Now that I am focused on the Lord and His grace rather than my own strength and will, I am able to serve Him joyously even though imperfectly. What a difference! Like night and day. God’s grace doesn’t give me a license to sin but instead of becoming discouraged by my weakness, I am able to serve and obey with great pleasure! Believers who still search for strength and obedience in themselves need to read this post. Thank you Tom, for sharing some of the paths through which our Shepherd has led you. We, like many others, grow up with the teaching of how much we need to give, without knowing what He has given that we can never do ~ the working of His grace in and through all our attempts and failures. Thank you! Yup, when that light switch turns on – oh, it’s about the Lord and His grace and not about what a great, obedient Christian I am – it’s like a tall, cool glass of water after trekking through the desert. Man it seems it took years for me to finally understand God’s grace and relations to works. Your comment reminded me to preach the truth without compromise but also to be patient with those I witness and minister to. Yes, it’s hard for people to accept that even our obedience is all about His grace. The church we attended for just one year after I returned to the Lord had its problems but I’m so grateful the pastor had a good understanding of grace-works. That was a gift from the Lord. 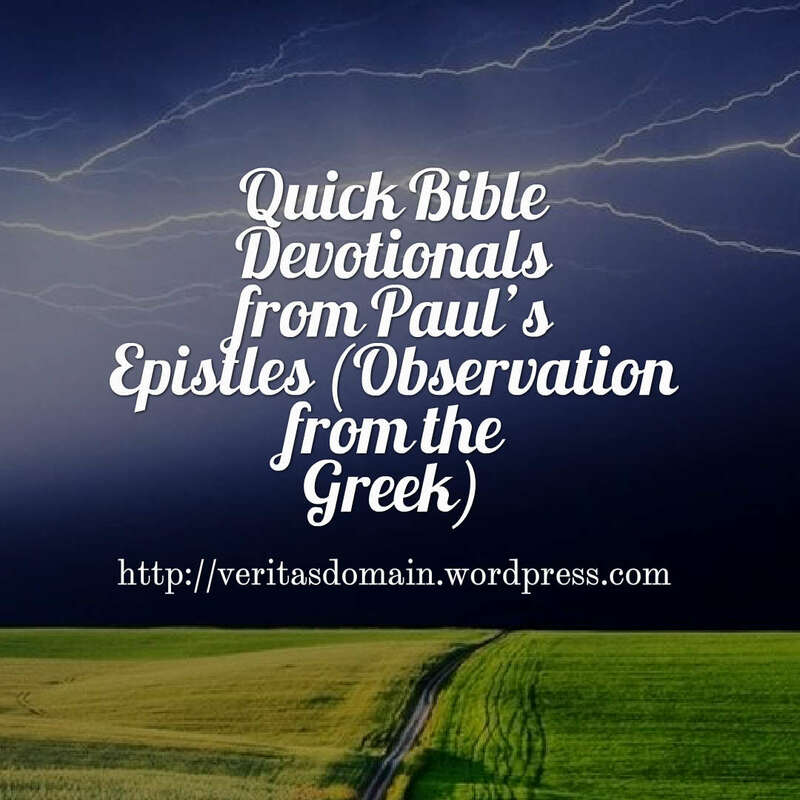 I really enjoy these “Observations from the Greek.” So helpful! Its helpful even for those who don’t know Greek though past devotionals point out things I wouldn’t have seen in the English. You are correct. But wait theres more than Phill. 2:12! The parable of the sheep and the goats in Matt. 25 sums up the core of false converts entire belief system. Good people do good works therefore they go to heaven on their personal merit. The, ” by faith alone people ” the goats, are not good people because they do not do enough good deeds therefore they have not EARNED nor DESERVE a reward. The false converts are now released from soul winning, defending the faith, holy moral living, and living by every word that proceeds from the mouth of God. Universal reconciliation by works irrespective of ones religion or lack of religion. Yes there is one way but not by Jesus but rather by our works.Easy squeezy lemon peesy. Thus their disdain for bible thumpers. Just go to the store buy some food throw it at a panhandler as you drive by and your heaven bound. Salvation is a meritocracy. Orthopraxy is everything and orthodoxy is nothing. An over simplification? Yes. But it makes the point. So comforting to know that the very desire I have to please God, is evidence of His Work within me. Amen. I noticed in my own life a biblical understanding of God’s sovereign work in my heart from the truth in places like Philippians 2:13 produces humility and thankfulness of God working within me rather than the pride I use to have as a young Christian of when I accomplish anything, however small it is. Amazing grace is it not? I’m blown away, grace not only saves us from the penalty of sin but the power of sin; it is grace that provides salvation but grace also provides sanctification! Also thank you for the reblog! Thank you, Jim! It was my pleasure to share it. Thank you Jim, I will use this as a related article for a future post, Good Works, a chapter in Beyond a Mere Christianity. Blessings for worship and the Word tomorrow. I am honored that you will use this in a related article for a future post, God bless you Frances, hope you have a blessed day tomorrow with God’s church! Amen…there is responsibility in light of these promises of what God is doing…we need to obey! God’s sovereign grace should not undermine but boost our confidence of God’s Work in us. I do make the distinction between self-confidence and confidence in God to work within us for us to will and to actually do something. I find it more biblical and practically more beneficial to live my life having my confidence of God working within me…with God getting the credit! Absolutely and amen! As you are aware, I am more the Charismatic. However, there are quite a few goof balls out there who have given us Charismatics a bad rep because they tend to take verses like Philippians 2:12 to the point of believing it is all about self. They think they can move God if they just have enough faith. That is called pride and will never move God. He is moved by faith in accordance to His Word and His Word alone. As you wrote, God’s grace should BOOST our confidence in Him and His work in us, NEVER in our own abilities. Example: I truly believe God still desires to heal the sick. However, all I can do is pray, have faith in God’s healing ability, and trust that He knows better than me the final outcome. If the person dies, such as with my dad, my confidence in God is not shaken because it was never about me to begin with. That is where many miss it. They think that if their prayed outcome does not happen, then they must have failed. This leads to anger and resentment towards God. That is a dangerous place to be because we then think we that we know better than God. on December 2, 2018 at 7:12 pm | Reply GOOD WORKS – God's Grace ~ God's Glory!